Jean Devanny's best-known novel is The butcher shop (1926), a bleak tale of covert relationships and overt violence set in the rural depths of the King Country. Love affairs and spurned advances culminate in the accidental death of one character and the murder of another. The book's content drew the unwanted attention of the government censor, and it was banned in New Zealand after being deemed 'sordid, unwholesome and unclean'. The novel is infused with Devanny's socialist and feminist beliefs. She moved to Australia with her family in 1929 and was active in communist circles there. 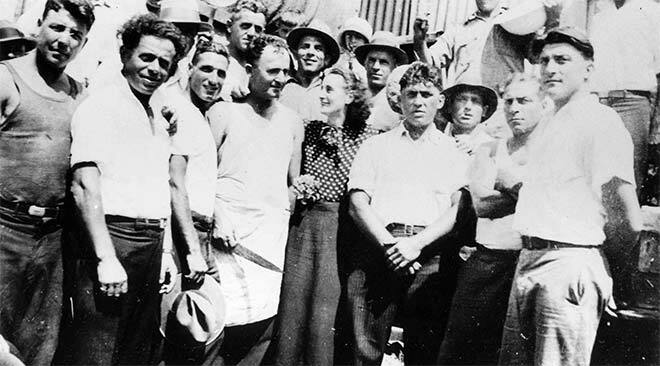 She is pictured with striking sugar workers in Queensland in 1935. Her novel Sugar heaven (1936) explored the role of women in the strike.